On a 2007 trip to China, we were introduced to a little exercise called “The Eight Brocades,” “Eight Pieces of Brocade,” or baduanjin. Our instructor was a tall, beautiful dancer and Kung Fu expert whom we nicknamed “Jade.” She was one of those people who could stand on one leg and slowly extend her other leg up until it touched her head. No hands. Geeez. 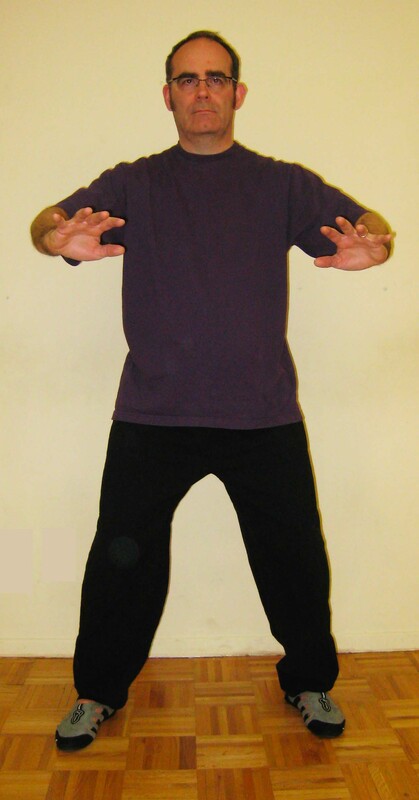 Baduanjin is a little qigong (Chi Gong, Chi Kung) exercise that can be done whenever you want. It’s meant to be done slowly and with awareness of all your parts’ working together. I know what you’re saying: “standing practice can’t be qigong, because you don’t move.” Well, zhan zhuang is referred to as standing qigong. Do it for a while, and that will make sense. Back to the three elements: baduanjin is based on movement, but requires the other two in order to become more than just a gentle calisthenic. We need to synchronize our breathing with our movements, always keeping it deep, but gentle. Check out this little animation to help slow down your breathing. I keep the arms round, not too close to the chest. I keep them slightly bent at the ends of the motion. I turn palms out relative to the sternum: palms up when above it, palms down when below it. Breathe in when the arms come in, out when they go out. relax in order to maintain your balance. See if you tend to shift to one side or the other, and gently compensate so you stay balanced. But you may ask: “what does this do? What’s the point?” Good question! Qigong practitioners make a lot of specific claims that seem pretty odd to westerners, but because they require some sensitive and complex navigation (well, I think so) I’ll have to tackle them in another post. Caveat: to me, it’s not a stretching exercise. If you do it as a stretch, you’re doing a stretch, not qigong, in my opinion. 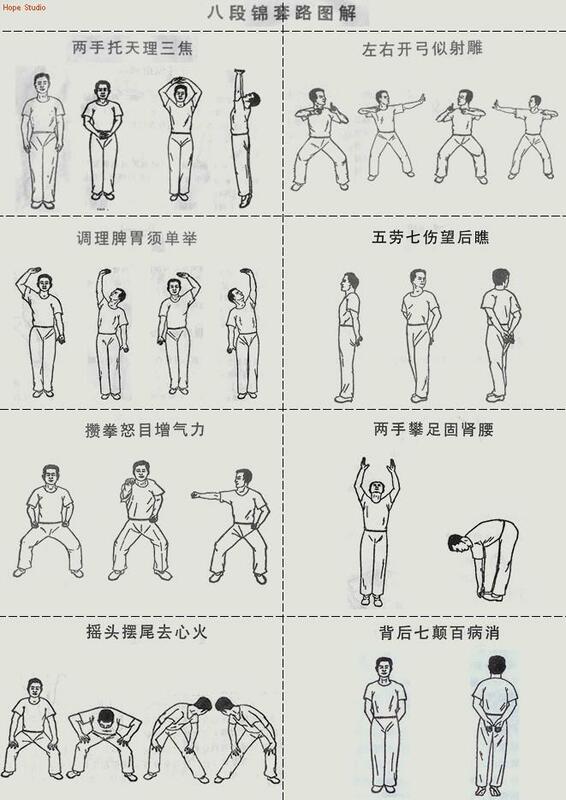 By all means, stretch, but do it in addition to a non-stretching qigong version. By “qigong version,” I mean that as we do the exercise, we need to be sensitive to our feeling of physical unity and our physical energy. The energy feeling is pretty subtle, and can be misinterpreted pretty easily. I’ll go into my impressions of it later. If you look for examples on the web, you’ll find a few different ways of doing the exercise. When I find a video that matches what I do, I’ll link to it. If you do start, pick a method (or order) that seems right to you. However, you should be prepared to change over time as you discover what actions feel best to you. I’ll write about my progress. Right now, let’s just say that if it’s done slowly, with synched breathing and awareness of the feeling of how the body’s parts integrate, all parts moving and stopping together, the exercise helps me get going and focus in the morning. More to come. One example of baduanjin. http://jadewushu.blogspot.ca/2013/03/ba-duan-jin.html?view=classic . If the left column were numbered down 1,2,3,4, and the left column were 5,6,7,8, I would follow this diagram in the order 1, 2, 3, 6, 4, 7, 5, 8, just because that’s the way I learned it. The first one became manifest in a small way at Mr. Rosenfeld’s Tai Chi workshop. During an exercise, he corrected my hands, saying that they were too tense and needed to be softened. It took me a few seconds to realize that I had forgotten the feedback mechanisms that I had developed (to some small extent) because of Zhan Zhuang. In other words, it was hard for me to tell whether my hands were soft or not. (This processing delay may explain the dumb look I gave Mr. Rosenfeld at the time.) I then attempted to implement the correction, but it felt very manual, deliberate and clunky. In contrast, a few months ago, if I had been given the correction at all, I probably would have recalled immediately what soft hands felt like and been able to return to that state by recalling the slightly tingling, open, “un-anchored” sensation of soft hands … as I’ve experienced it, anyway. Guess I’ve got some work to do. More standing? More standing.